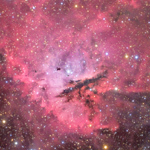 The Pacman Nebula is powered by a young star cluster, IC 1590, located right in its center. 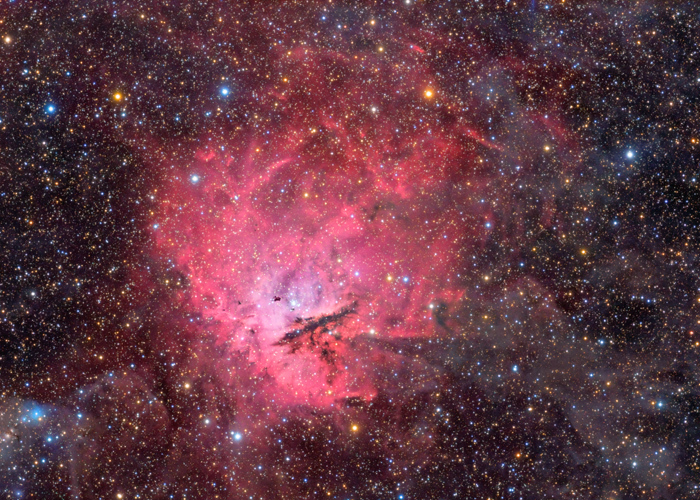 Spanning about 80 lightyears, this nebula is about three times further away than the Cocoon Nebula, i.e., 10'000 ly. The columns around the cluster and the dense dust globules are eroded by intense, energetic winds and radiation from the cluster stars. The strong radiation induces turbulences in these structures which usually result in new stars being formed. 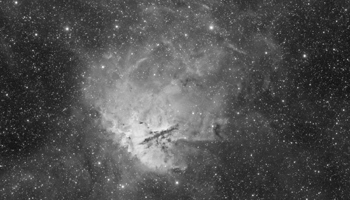 My goal with this image was to show the faint molecular cloud around the well known Pacman Nebula. 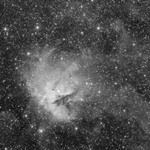 The surrounding cloud is best seen in the luminance image (click on the right thumbnail below for the luminance). A 100% resolution crop of the central area can be seen when clicking on the left thumbnail. A 200% resolution crop of an interesting/funny part of the image can be found here.